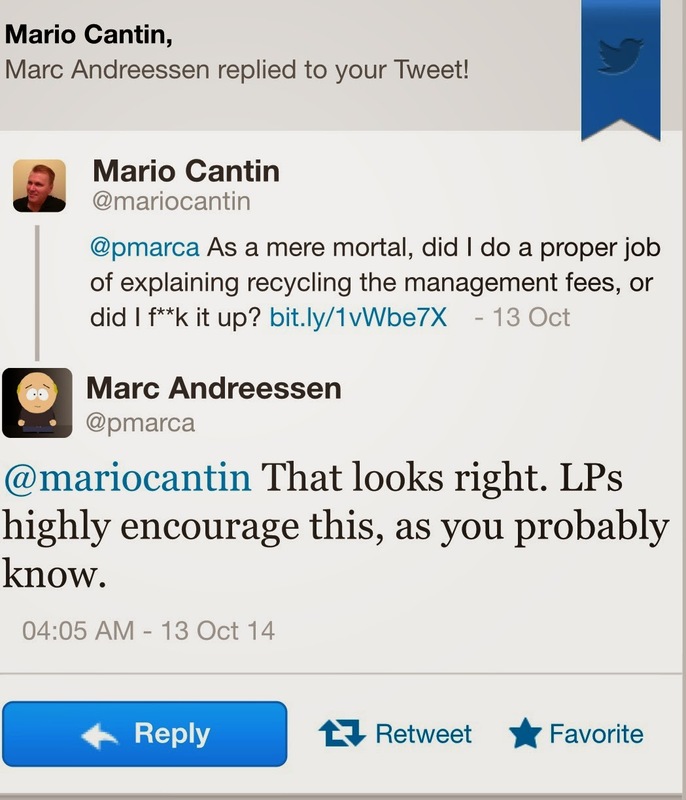 Mario Cantin's Excogitations: What do VCs mean exactly when they say they recycle their fees? What do VCs mean exactly when they say they recycle their fees? A fellow student on the Venture Deals course asked me the following question a few hours ago. Below is my reply. I recognized that it would also make a likely useful blog post, and so here it is. Let’s say a VC firm raises a fund for $100M. But they are expected to return the entire $100M before they are entitled to receive a commission (called carried interest or carry). The carry is 20% of the returns above the $100M that was initially invested. Minus the $15M management fee that was paid to the VCs by the investors in the fund. The total profit so far is $260M, of which the VC firm is entitled to 20%. Therefore, the VC firm gets to keep $52M. The investors in the fund (called limited partners or LPs) get to keep $308M, which consists of a profit of $208M plus their initial investment of $100M, which means that in practical terms, the VC firm does not keep the management fee since they have to return it along with the money that was actually put to use (investing in high growth companies — in startups, in other words), before they can get their carry. So, in actual fact, the VC firm really only needs the management fee if they fail at their job, which is hardly the idea; and that is why it makes sense for a VC firm to take the first $15M of returns in a fund and re-invest it in more companies instead of remitting it to the LP’s. What this does, is it increases the amount that was actually put to work to 100%. Instead of having $85M eventually turn into $360M, now they have $100M that will turn into something hopefully even greater than $360M. This is called recycling the management fee. What this actually means in plain English is that the VC firm is basically saying, screw this, we don’t need a management fee. We accept it as an advance payment, but we’ll give it back to the LPs at the end. A VC firm who recycles their fee is confident that they will succeed enough that the management fee is not a safety net that they need; and instead, they want to further increase their odds of getting a better return for themselves and their LPs by putting their fee to work by investing it in their portfolio companies, instead of keeping it for themselves. Keep in mind that the above financial breakdown is oversimplified, as in real life, the VCs invest usually 1% of their own money into the fund and the LPs put in the remaining 99%, which changes the math accordingly.